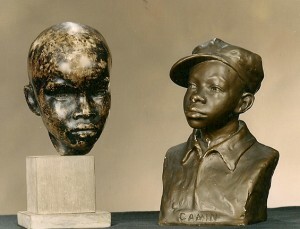 On Wednesday, April 7, my statue, Black Boy (“Head of Boy”) by famed Harlem Renaissance artist Richmond Barthe (1901-1989), will be part of the African American Fine Art auction at Swann Galleries in Manhattan. This will be the end of my journey with Mr. Barthe, filled with culture and coincidence, that began in 1999, when I purchased the statue on eBay for $350 while looking for vintage collectibles about Black children. I had a hunch it was authentic. At that time, I was writing a major piece on Harlem Renaissance artist and scholar Lois Mailou Jones for Howard University Magazine and had piles of Black art books on my computer. A few years earlier, I had worked with Ms. Jones as the PR director/consultant for Studio Museum in Harlem under Kinshasha Holman Conwill, now deputy director of the Smithsonian’s National Museum of African American History and Culture. 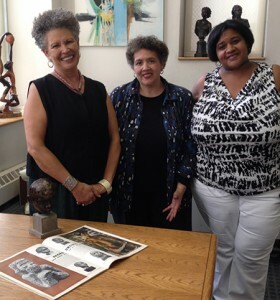 My sojourn to authenticate the statue led me to the Schomburg Center for Research in Black Culture, which holds the largest collection of Barthe’s work on the East Coast and Dr. Margaret Rose Vendryes. By coincidence, Dr. Vendryes was the Schomburg’s scholar-in-residence and was researching her Princeton doctorate thesis on Barthe, which evolved into her landmark book Casting Feral Benga: A Biography of Richmond Barthé’s Signature Work. After she authenticated the statue, I put Mr. Barthe in my cabinet and continued my hobby collecting historical artifacts on Black children. That’s when I discovered a chalkware statue of Augusta Savage’s famous Gamin on eBay. Ms. Savage headed the WPA’s art project in Harlem and Gamin was one of the most renowned works of the Harlem Renaissance and copies were extremely rare. It was 2000 and the seller had misspelled Savage’s name and I won the statue for $60. My collection now included two museum piece works by Harlem Renaissance artists. I was oddly treading into Oprah Winfrey collecting territory—the sport of millionaires. A friend Valerie Mercer, who was curator at Studio Museum in Harlem and now curator of African American art and head of the General Motors Center for African American Art at the Detroit Institute of Arts (DIA), kept telling me to talk with art appraiser Michael Chisholm. I procrastinated until one night I was standing next to newsman Ed Bradley looking at a Gamin’. My mother kept saying, “We have Chisholms in our family.” She was right. Michael turned out to be my cousin. He had grown up with my mother and his grandmother was my great-great aunt! By 2003, my mother began a hospitalization that would shorten her life. I needed money. Art dealer June Kelly represented selling my Augusta Savage and called me one year to the day that my mother went into the hospital with a sale that paid for house repairs—plumbing and a new roof! Now, my odyssey with art from the Harlem Renaissance is closing. My Richmond Barthe statue is being sold at Swann right before Lois Mailou Jones’ Portrait of Richard B. Harrison (De Lawd). I know it’s culture, but it’s beyond coincidence.